A United Air Lines Viscount turbo-prop with 39 aboard crashed and burned at 6:15 p.m. Thursday in the East Tennessee foothills of the Smokies near here. There apparently were no survivors. Police said there was no sign of life around the wreckage. "I looked up and saw bodies flying everywhere," said Asst. Police Chief ALVIN WEBB. WEBB said many of the bodies he saw at the scene were unrecognizable. ALFAN ATKIN, manager of the Knoxville airport, said the plane was Flight 823, bound from Washington to Knoxville. The plane crashed in a wooded hollow off U.S. 411, 8 miles northeast of this town near the Tennessee-North Carolina line. It was disclosed in Washington that United Airlines has asked the Federal Bureau of Investigation to make an inquiry into the crash. FBI disaster specialists also were sent to the scene to help with the identification of victims. United Airlines Flight 823 was a scheduled flight from Philadelphia International Airport, Philadelphia, Pennsylvania to Huntsville International Airport, Huntsville, Alabama with 39 on board. On July 9, 1964 at approximately 18:15 EST it crashed 2 miles northeast of Parrottsville, Tennessee after experiencing an uncontrollable fire on board, killing all 39. The fire of unknown origin initiated below the passenger floor and eventually involved the passenger cabin. One passenger attempted to abandon the aircraft through the No.4 escape window prior to impact but did not survive the free-fall. The ignition source was never determined, but it is thought the plane's battery overheated or something in a passenger's luggage caused the fire. According to NTSB investigators, lethal amounts of CO2 were present in the cockpit, explaining witnesses' reports of the aircraft seen flying erratically. The fire eventually burned through the cockpit and it is likely the crew was unconscious by that time. The flight took off from Washington at 16:36 EST for a flight to Knoxville and Huntsville. Near Parrottsville, TN the aircraft was seen flying at a low altitude, trailing smoke. A passenger was seen falling from the plane, followed by a cabin window. The plane then assumed a nose high attitude and lost control. 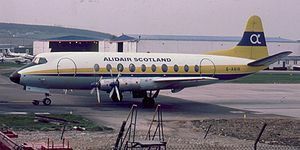 The left wing and nose went down and the Viscount crashed. PROBABLE CAUSE: "An uncontrollable in-flight fire of undetermined origin, in the fuselage, which resulted in a loss of control of the aircraft."